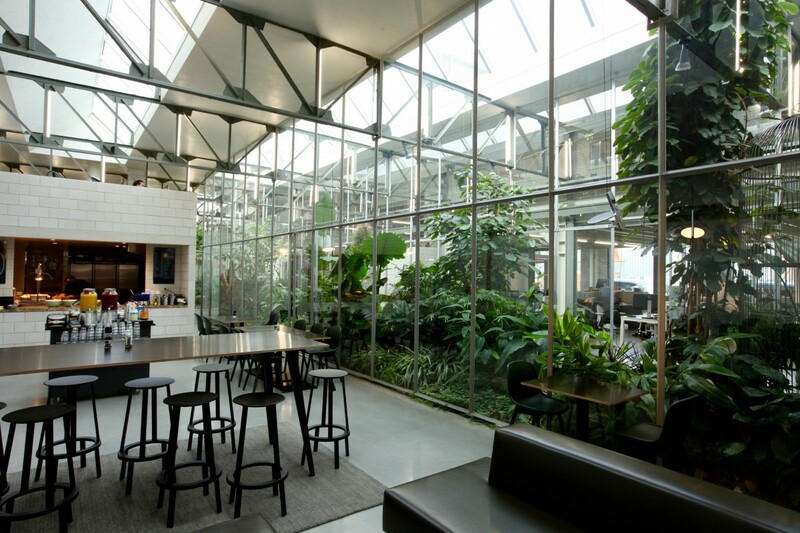 For Joolz HQ Netherlands we designed and built an set of Greenlungs inside their new HQ. The Greenhouses are in total 120 m2 tropical and subtropical garden used for working and meeting. They are in the heart of the building, where everybody has a clear view on the gardens, separating the working part from the lunch/meeting part of the building. The Greenhouses of 1000m3 produces clean air for the entire building of 5800m3. We did this by lifting the greenhouse 5 cm off the ground and 5 cm from the ceiling. 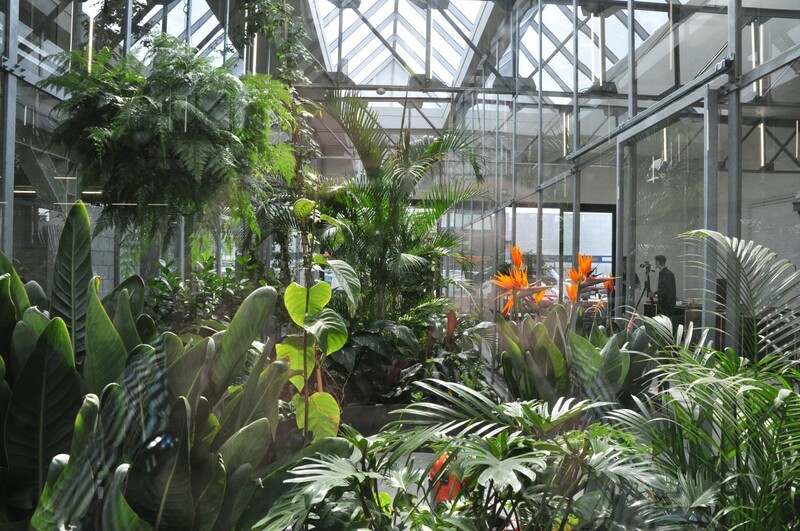 The air flows in a circular way through the greenhouses without any active ventilation. Active ventilation is only in use when the air is to humid in the middle of summer. For watering the garden we used a hydroponic system underneath that, without any technics or pumps, makes it possible for the plants to get water from underneath like in nature. We placed a dripping system as an extra with the start of the garden. The garden is a year old and the plants grew enormous within a year. We do the maintenance every week for 1 hour just to see what happens and to learn for next projects to come. Maintaining a garden means knowing why plants grow or not, what could be better in future so to learn from the mistakes and successes what happened. 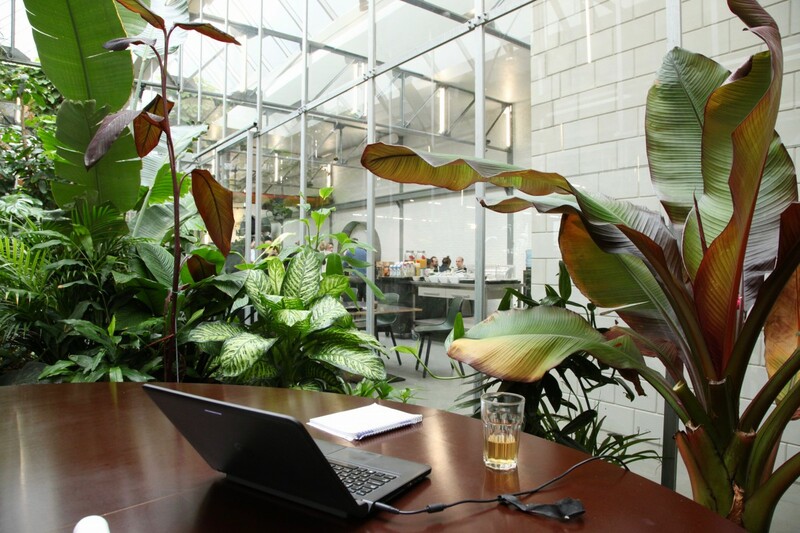 We believe in Greenlungs making office and living areas around people greener and making people happier and healthier!